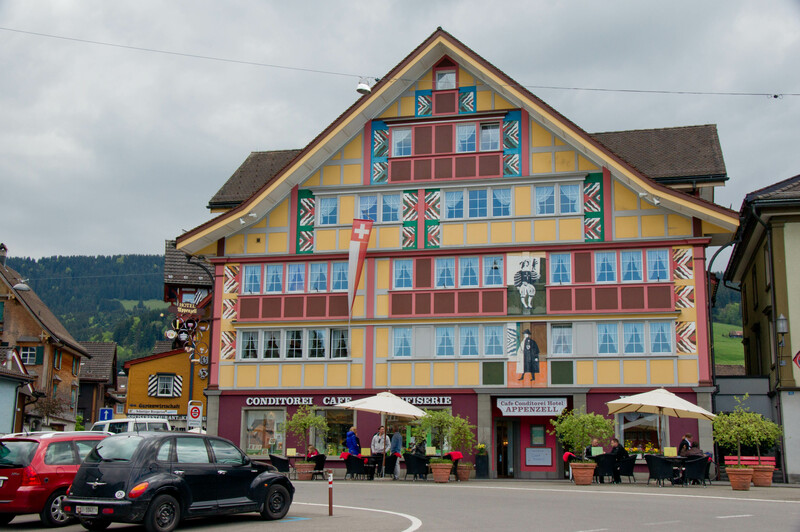 I finally arrived in Appenzell, Switzerland. It is about an hour drive from Zurich to the northeast. After not sleeping for 24 hours, the drive is always a challenge. I got a larger car than anticipated because I showed up an hour earlier than expected. I received a free upgrade mostly because I said I didn’t want a manual transmission. I was pretty tired the first night and forced myself to stay awake till 5:30. Today was our first full day here and I’m over my jet leg thanks to the good long night sleep I had. I’m keeping this post pretty short so I can get to bed to get a jump start on my day tomorrow. Below is a picture of the hotel we are staying at. When I first pulled up in the parking, there was our large car, a couple of smaller cars and large tractor parked in the parking lot. I only wish I was here for the day they send the cows to the mountains. Unfortunately, it must be next weekend. Such a cozy looking hotel. So happy that you are exploring new sites. I want to hear all about your trip!